The following text is based on a lecture made by Bill Rosenburg to the Global Peace and Justice Network in Auckland on 17 June 2003 and to scholars and students of journalism at the Auckland University of Technology on 18 June 2003. This was before the takeover by Fairfax of INL’s newspapers had been finalised. Rosenburg began by emphasising that his expertise, as far as it exists, lies in ownership of the news media, not as a media commentator. There is an effective duopoly in each of the main media – Print, Television and Radio. The Internet is a new and growing source of news. Three, and shortly four, companies dominate. Because of its nature – a mixture of distribution channel and content, news, other information and content – it is more difficult to describe. The main owners – who are they? Does it matter? What can be done? The two companies which dominate our print news media are Independent Newspapers Ltd (INL) and Wilson and Horton. 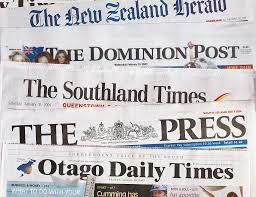 In 2003, INL newspapers had nearly half (47.4%) of the audited daily newspaper circulation in New Zealand. Its main newspaper competition is from Wilson and Horton, which had 43.8% of the daily newspaper circulation in 2003 (29.3% of which came from the New Zealand Herald, the largest circulation newspaper in New Zealand). The two between them in 2003 owned 87.4% of audited daily press circulation of the provincial newspapers (those with under 25,000 circulation), and 92.2% of the metropolitan readership (those newspapers with more than 25,000 circulation). In addition they have extensive and increasing ownership of community newspapers, and magazines. Only about 70,000 readers still have an independent daily newspaper. The largest such daily, the Dunedin Otago Daily Times, with a circulation in March 2003 of 44,546, is owned by Allied Press, belonging to the Smith family, which also owns the Greymouth Evening Star, West Coast Timesand a number of community newspapers in Dunedin, Otago, Southland and Westland. There are only six other audited locally owned daily newspapers. INL’s most profitable daily is the Christchurch Press, which has a near monopoly in Christchurch. It also owns the Dominion Post and in fact all the daily newspapers with circulation greater than 25,000 other than the New Zealand Herald, Hawke’s Bay Today and the Otago Daily Times. In 2003 INL had 93.7% of the audited circulation of the country’s six national weekly newspapers. INL’s print and Internet media are detailed in the accompanying table. Its magazines include the country’s largest selling publication, TV Guide, and it has a virtual newspaper monopoly in many cities and in the national Sunday newspapers. Numerous titles have come and gone amongst its magazines, mainly purchased from other companies (at least 12 since 1992), but with a few of its own startups. In 1998 it announced a new glossy, Grace, aimed at the « independent woman ». The May launch had a touch of farce when rival Australian magazine Claudia came out with the same cover photo of Hollywood star Helen Hunt. INL Magazines reportedly resolved the matter by buying every copy of Claudia bound for the New Zealand market. It was not a good start: the magazine closed in January 2001. Wilson and Horton, in addition to its flagship, the New Zealand Herald, owns eight provincial newspapers. It owns the large-circulation magazines New Zealand Listener, perhaps the only title in the mainstream print media which is genuinely on the Left of the political spectrum, and theNew Zealand Woman’s Weekly and publishes several magazines on contract. Its subsidiary Community Newspapers Ltd has 32 giveaway community newspapers. The two remaining national newspapers are the Politically Correct (from the Right) National Business Review (circulation 13,401 at 31 March 2003), and The Independent (circulation 9,680), two business papers which are in constant bitter, often vitriolic, rivalry. Both regularly demonstrate some of the most lively investigative journalism in New Zealand. NBR is owned by New Zealander Barry Colman’s Liberty Press, formed in 1997, which also publishes New Zealand Personal Investor, New Zealand Business Who’s Who, and The Capital Letter amongst others. It sold 15 titles to Kerry Packer’s Australian Consolidated Press in November 2001(of which more shortly). The Independent, which tolerates a considerably broader range of views in its columns (despite having Roger Kerr on its board! ), is owned by a former National Business Review editor and award-winning investigative journalist, Warren Berryman. The Auckland yuppy Metro is owned by Kerry Packer’s Australian Consolidated Press (ACP), one of the two largest magazine publishers in Australia (which also owns Hoyts Cinemas). It also publishes Australian Women’s Weekly (New Zealand edition), Buy Sell and Exchange, Cleo (New Zealand edition), North and South, and several more. It is continuing to accumulate titles. PMP, controlled by the Seven Network of Australia, publishes New Idea and seven other magazines in New Zealand. Even some of New Zealand’s most important rural publications are overseas owned. Federated Farmers’ flagship Straight Furrow was sold to the Australian-owned New Zealand Rural Press Group in January 1999, which is controlled by the Fairfax family. TV1 and TV2 are still state owned, but TV3, after a turbulent history, was purchased by the biggest privately owned TV broadcaster in Canada, Canwest Global Communications Corporation. It launched TV4 shortly before the October 1996 election, in a politically charged presentation. The commitment of TV3 and TV4 to local content has been widely criticised. In 1999 it reached a nadir, the two CanWest channels screening no new local drama or comedy shows during the year. Only New Zealand On Air funding persuaded it to recognise its New Zealand location in 2000. Prime Television New Zealand Ltd, owned by Prime Television Ltd of Australia started regional broadcasting in 1998. Prime Television runs regional television services throughout Australia, being its largest regional broadcaster. It developed a new Auckland facility at Albany and broadcast into Dunedin, Christchurch, Wellington, Hamilton and Auckland, including local news and commercials. Despite its optimism, it failed to make any profits in New Zealand, losing over $10 million in 2001, possibly because it featured high quality documentaries and drama which TV1 no longer appeared to be interested in. In December 2001, Prime announced a deal with Kerry Packer’s Publishing and Broadcasting Ltd (PBL). In return, PBL gained an option to buy 50% of Prime New Zealand by 2008. The new mass-market Prime programming competes directly with TV2 and TV3, and is gaining market share,. A number of small regional TV stations also exist, with very small market share. In Christchurch they have been associated with a succession of extreme Right businessmen and fundamentalist Christians. It is a fascinating story we do not have time to go into here. The monopoly cable and satellite pay TV operator, Sky TV (Sky Network Television Ltd), was founded by business pillars of the New Right in New Zealand, Craig Heatley (an ACT Party founder and financer), Terry Jarvis, and Tappenden Construction (headed by fellow New Right evangelists, Alan Gibbs and Trevor Farmer). Sky has made a determined attempt to corner the market: it owns about 86% of available frequencies in the South Island, but used only about 40%. It bought them as a commercial block to prevent other parties getting them according to former CTV director of resource, Grant Roberts. In 1997 it also added satellite broadcasting to enable it to reach the 30% of the country not receiving it via UHF. In 1997, INL took a controlling shareholding in Sky TV. With later share purchases, including some from TVNZ, its current shareholding is 66.25%,. In 1999, INL bought out most of TVNZ’s share in a deal reeking of special favours. It was at a price well below market value, apparently on the feeble – and anti-competitive – grounds that « TVNZ places considerable importance and value on a positive and co-operative ongoing relationship with Sky and its existing major shareholders ». Even the Stock Exchange’s Market Surveillance Panel asked for an explanation. It did not pay dividends: within weeks, Sky was ditching TVNZ for TV3 to rebroadcast its sports – rugby, rugby league and cricket – and provide Sky’s news feeds. In February 2001, Telecom bought out Tappenden’s 12.2% of Sky for $192.6 million and took a seat on its board. Sky lobbied the Government to have TVNZ broadcast TV1 and TV2 through Sky’s digital network. It achieved its aim in a ten-year deal announced in November 2001, after an open access deal between TVNZ and TelstraSaturn fell through. The publicly owned channels will still be free to air, but the deal forces viewers to buy a limited, proprietary Sky set-top-box to decode signals – thus giving Sky monopoly control of digital services, the future technical direction of television,. « Forget any advanced interactive services TVNZ might want to develop, and forget any idea of access to the Internet through digital television, » said Paul Norris, former senior TVNZ executive and head of the Broadcasting School at Christchurch Polytechnic Institute of Technology. « Most of all, forget any idea that TVNZ is any longer in control of what services it can develop or offer. It will be in thrall to Sky. If Sky does not want to carry these services, it will simply say no. » TVNZ’s channels will also introduce local content largely lacking from Sky’s content, apart from sport. The government says it does not rule out regulation of Sky’s digital platform to ensure access for all broadcasters. In April 2002, the Internet site radio.net.nz listed 212 radio stations operating in New Zealand. While a large number of small local community radio stations have sprung up in the last few years including 11 community access stations operating from Auckland to Invercargill, and 25 iwi radio stations funded by Te Mangai Paho, the concentration of ownership of stations is rapidly increasing. In 1996 there were 157, of which over half (87) were owned by just three companies: New Zealand Radio Network, Radio Pacific and Energy Enterprises. Since then Radio Pacific and Energy Enterprises have merged, taken over a number of other stations, and in turn been taken over by CanWest. Meanwhile, New Zealand Radio Network has also continued to accumulate stations. The only solid competition to these two networks is the State-owned non-commercial National Radio and Concert networks. In 1996 the commercial stations of Radio New Zealand were sold for $89 million to three companies closely associated with Tony O’Reilly. The purchaser was New Zealand Radio Network Ltd, which was then owned one-third each by Wilson and Horton Ltd, Australian Provincial Newspapers Holdings Ltd (APN), and Clear Channel Communications Inc of the US. APN (which later changed its name to APN News & Media, or ANM) is 44% owned by Independent Newspapers Plc of Ireland which is 25% owned by the O’Reilly family. Clear Channel Communications and APN each owns 50% of the Australian Radio Network (ARN) which owns 12 metropolitan radio stations in Australia. It now owns New Zealand Radio Network. O’Reilly’s acquisition consisted of 41 stations plus the Radio Bureau – an advertising production studio – and Radio New Zealand Sport. Initially New Zealand Radio Network continued to use Radio New Zealand’s news service, dumped it in April 1997. It made numerous additional acquisitions, including Prospect, Independent Radio News and sports service, and seven further companies including the Primedia group. This purchase brought criticism from the Labour Party for its cramping of competition and the absence of rules on cross-media ownership, and additionally by the Alliance for the growing foreign ownership of broadcasting. It currently claims to be the country’s largest commercial operator with 53 stations and more than 50% of advertising revenue. For many years, Radio Pacific was the only independent network, but growing through acquisitions. Radio Pacific’s chairman, Derek Lowe, said, « I do feel there should be some media companies that are owned and therefore controlled by New Zealanders. » He made sure of this by continuing his acquisitions. In 1999, Radio Pacific merged with Radio Otago, one of the oldest independents in New Zealand, to form RadioWorks. CanWest started its radio empire with the More FM radio network, Channel Z and The Breeze. Then in 2000 when it launched a bid for RadioWorks. Despite Lowe’s criticism of the price offered, CanWest’s tactics of standing in the market for shares without consulting the RadioWorks board, the board’s « don’t sell » recommendation, and Lowe’s previous brave words extolling New Zealand ownership of New Zealand news media, he led the lolly scramble to sell his shares. In December 2000 CanWest made an offer for remaining shares and was assured of success when Energy Investments Taranaki, a 10.6% shareholder earlier taken over by Radio Pacific, accepted the offer. Its chairman, Norton Moller, said that « CanWest’s bid had thwarted the aspirations of many RadioWorks shareholders who had wanted to be part of a strong and influential New Zealand-owned radio company ». RadioWorks was by then the second largest radio company with Radio Pacific, The Edge, The Rock, and Solid Gold networks plus 22 other local stations. The takeover gave it an advertising revenue share of 47-48%. RadioWorks’ public behaviour has been less than exemplary. In July 2000, it was criticised by the Broadcasting Standards Authority’s chief executive for « causing difficulties by not supplying the authority with audio tapes of contentious shows », despite the fact that they were required to keep news, current affairs, and talkback tapes for at least 35 days. Broadcasting Minister Marian Hobbs threatened to increase the Authority’s powers because when complaints were laid against « certain private radio stations », they would « accidentally delete » the only copy of the broadcast. Similar behaviour and fines have followed, including making a kind of history in August 2002 when a judge, Mark Lance, QC, won an out-of-court settlement against Radio Pacific for defamation, believed to be tens of thousands of dollars, after talkback host Mark Middleton made a sustained attack on him over several weeks in terms the judge’s barristers described as « scandalous, humiliating and untrue, injuring his professional reputation ». It was believed to be the first time a judge had won a payout over media criticism. A rapidly growing alternative source of information and entertainment is the Internet. Originally run not-for-profit by educational and research institutions, the realisation of its commercial potential has led to commercialisation as rapid as its growth. This threatens its open nature. Internet Service Providers (ISPs) in New Zealand were initially either Universities, their commercial off-shoots, or small businesses set up for the purpose. PlaNet, founded by environmental activists, has independent services in a number of centres. A host of others are struggling to exist against larger competitors including WorldCom New Zealand (formerly Voyager, owned by WorldCom of the US, subject of one of the world’s largest accounting scandals), ClearNet and Paradise (both owned by TelstraClear) and Telecom’s Xtra. Xtra is particularly controversial because of its predatory pricing. Soon after its startup in 1996 it dropped its prices to below what it charged other ISPs, and, they claimed, below cost. Second to Xtra is the locally owned Internet Group (Ihug). The line between the Internet and other publishing and communications is increasingly blurred. Telecom’s stake in INL and ownership of Xtra have already been noted, along with its interest in pay television. TelstraClear has similar ambitions. Both INL, with its Stuff Website, and Wilson and Horton, with its own Website including the New Zealand Herald, are now publishing over the Internet as well as conventionally, but there are many more examples. The international Independent Media movement – Indymedia – bravely attempts to provide alternative sources of news, including in New Zealand, largely using volunteers. In addition, there are commercial labours of love such as Scoop, which also provides alternatives sources of news, and outlets for organisations which would rarely find mainstream media coverage. INL is currently just over 45% owned and therefore controlled by News Ltd, the Australian branch of Rupert Murdoch’s US-based News Corporation, one of the world’s Big Seven big global media empires. In July 2003, Fairfax Holdings of Australia bought its New Zealand print media. It will be left with just Sky TV, and there is speculation that News Corporation will make a full takeover. In total, INL is 76% overseas owned and other shareholders include Telecom with a 9% shareholding and a seat on the company’s Board. The other main shareholder of INL is the Todd family. Overseas, Murdoch is highly controversial for his raids on newspapers from Australia to the UK to the US. He gave away his Australian citizenship so he would be allowed to buy TV channels in the US – and then complained when he couldn’t buy channels back in Australia. In the UK he used vicious union-busting tactics, including police and Australian transport firms, to move his papers out of Fleet Street and de-unionise them. Neither is Murdoch above tax avoidance. In 1997 the UK, the US, Canada and Australia set up an international tax investigation into News Corporation – it paid almost no tax that year: 7.8% of profits in the previous year, as compared to 28% for the Walt Disney corporation (one of the other Big Seven media transnationals). Concerns about his corporation’s tax habits have also been raised in the UK, Israel and the US., In 1989 an Australian Parliamentary investigation found News Corporation was using tax havens such as the Dutch Antilles, the Cayman Islands and Bermuda to launder its profits. In the UK, News Corporation subsidiary, British News International paid only 1.2% of its profits in tax, compared to a company tax rate of 33%. As we will see, tax avoidance is a pattern among media owners in New Zealand. A few months after the 1996 election to power of the Howard-led government in Australia, Murdoch criticised it for not carrying out radical reforms, saying New Zealand was the model to follow. A major factor in the 1997 « New » Labour election victory in the UK was Murdoch’s support for its leader, Tony Blair, via the Sun newspaper – which had supported the Conservatives in the previous election. His support did not go unrewarded. In February 1998, the House of Lords voted to tighten competition law to curb Murdoch’s tactics of setting « predatory » low prices on his newspapers (such as the Times) to drive rivals out of business. This was opposed by Blair, his spokesperson saying, « This amendment will not become law. It doesn’t add to the effectiveness of the Bill and singles out one company in a way that is unnecessary ». The following month, Blair tried to help Murdoch take over an Italian TV station, Mediaset, by speaking directly to the Italian Prime Minister, Ramano Prodi. Murdoch is frequently criticised for the influence he has on editorial policy – towards entertainment and the reactionary. He strongly defends his right to interfere in editorial matters: « it’s my responsibility sometimes to interfere » he told a forum in January 1999. He took the BBC off his Asian Star satellite service because of its critical documentaries about China and in 1998 he intervened to prevent his publishing subsidiary, HarperCollins, from publishing a book critical of China by the former Hong Kong governor, Chris Patten. In a notorious case, reporters at a television station owned by Fox, a News Corporation subsidiary in the USA, produced a report critical of Monsanto. They were sacked when they refused to modify their story. The station manager pressured them to back down by saying: « We paid $3 billion for these stations. We’ll tell you what the news is. The news is what we say it is! ». Murdoch explicitly backed the US invasion of Iraq, saying, « We can’t back down now, where you hand over the whole of the Middle East to Saddam…I think Bush is acting very morally, very correctly, and I think he is going to go on with it ». Once again he backed Tony Blair: « I think Tony is being extraordinarily courageous and strong… It’s not easy to do that living in a party which is largely composed of people who have a knee-jerk anti-Americanism and are sort of pacifist ». He was clear in his rationale: « The greatest thing to come out of this for the world economy…would be $US20 a barrel for oil. That’s bigger than any tax cut in any country ». In another interview he gave further explanation: « Once it [Iraq] is behind us, the whole world will benefit from cheaper oil which will be a bigger stimulus than anything else ». The UK Guardian surveyed 175 of « the highest-selling and most influential papers across the world owned by Murdoch’s News Corporation ». It found none had opposed US and UK actions, and many actively derided opposition to the invasion. « How lucky can Murdoch get! He hires 175 editors and, by remarkable coincidence, they all seem to love the nation which their boss has chosen as his own, » commented the Guardian’s writer, Roy Greenslade. Locally, INL does a fair imitation of Murdoch’s views. At INL’s annual meeting in 1992, after some years of staff cuts and new technology, the then chairman, Alan Burnet, asked for more tax relief, described unemployment as a « wretched plague on society and an enormous drain on welfare funds », and acclaimed the (former) Employment Contracts Act as « one of the most important developments of recent years. » The reason for its enthusiasm was related to Parliament by the Engineers Union in June 2000 when it named INL and Telecom at the top of a list of nine companies which acted in bad faith under the Act. The attitudes continued into 2001 when the Employment Relations Authority ordered INL to meet its employees’ union representatives, finding that it had failed to act in good faith. Direct political involvement was revealed in the 1999 election when INL admitted to making donations to National and Labour as « an indication of support for the political process ». Senior Lecturer in Journalism at University of Canterbury, Jim Tully, however commented that « media companies should not be donating money to political parties », and that they were even more difficult to justify if they did not treat every party the same. John Fairfax Holdings Ltd, which has 21.4% of the Australian capital city and national newspaper market, has a good reputation for its journalism in Australia, where it publishes the generally well-regarded Melbourne Age, the Sydney Morning Herald, and The Australian Financial Review which allow a variety of opinion. Nonetheless its management is politically conservative. For example, there was concern in Australia last year when former Liberal Party Treasurer, Ron Walker, who still had strong political ties, was named as a director. There is an ongoing debate within the company as to the degree of centralisation of its activities, which may well show up in its operations in New Zealand. Though it carries the Fairfax name, the company no longer has Fairfax family ownership. This is a reflection of a weakness which may come back to haunt us. The company almost went bankrupt in the early 1990s and was forced to sell its magazine division and other assets. Kerry Packer and far-Right Canadian media magnate, Conrad Black became controlling shareholders in 1991. Eventually Black withdrew, and Packer was constantly on the edge of breaching Australia’s media ownership rules. In 2001 he sold his 14.9% shareholding, leaving largely institutional shareholders including Bankers Trust Australia Ltd (8%) and Tyndall Australia Ltd (10%). It is commonly regarded as the weakest of the major media companies in Australia financially, but with highly desirable assets. Both Packer and O’Reilly have shown recent interest in purchasing it. O’Reilly might – but would not necessarily – have difficulties with the Commerce Commission as it would give him almost total control of New Zealand’s print media. Fairfax’s weakness, particularly after this major acquisition, may also lead to problems with maintaining and expanding its operations, and in competing with the O’Reilly empire. But Fairfax is by no means squeaky clean. Part of its formula for buying INL’s newspapers was for us, as taxpayers, to help it. Using a scheme that O’Reilly is using with Wilson and Horton, the plan was to sell the mastheads of the newspapers to a US bank and lease them back. Tax advantages in both New Zealand and the US would have doubled the return on Fairfax’s acquisition – using a handy $23 million of our money in tax benefits. Unfortunately for Fairfax, the Minister of Finance announced he would close the loophole. Just how much Wilson and Horton’s owners have been making a year from our taxes has not been revealed. O’Reilly revalued the company’s mastheads from $82 million to $794 million after he purchased Wilson and Horton in 1996, and then sold them to JP Morgan of the US for $1.1 billion when Wilson and Horton was resold to O’Reilly’s Australian company, ANM. Just to complete the tax-avoidance picture: Kerry Packer, the richest man in Australia, is notorious for his gambling (in September 2000 he lost $46 million in a single gambling spree) and his tax avoidance (in 1991 he famously told the Australian House of Representatives Select Committee on Print Media: « if anybody in this country doesn’t minimise their tax, they want their heads read »). Until May 1995 Wilson and Horton was a rarity amongst large New Zealand companies: it was New Zealand owned. Courtesy of a raid by Brierleys on its shares, however, Irish newspaper group, Independent Newspapers Plc (INP, now Independent News and Media, INM), gained a controlling 28% interest. INP steadily built up its shareholding and gained full control in 1998. In 2001, INP sold its shareholding for $999 million to APN News and Media (ANM), the Australian company in which it has a 44% shareholding, and which already was a partner with it in The New Zealand Radio Network. The move was partly to release funds for other purchases (O’Reilly was interested in John Fairfax Holdings) but also as a way of avoiding Australian media ownership laws that restrict foreigners to 25% of a newspaper company and prevent control of television, radio and newspapers in the same market,. INP is controlled by the O’Reilly family, headed by the Irish former rugby international and billionaire, Dr Tony (now Sir Anthony) O’Reilly, who hit New Zealand screens as the Chief Executive Officer (CEO) of HJ Heinz and Company when it took over another icon, Watties Ltd (he has since resigned from his Heinz posts as both CEO and then chairman of Heinz). « Looking at and participating in the miracle of New Zealand in commerce, I have no doubt whatsoever that the next century will confirm what we already know – that New Zealand has found the economic way of fairness and transparency and a real return on capital; and that because of this, many others are in the process of finding the way to invest in this extraordinary country ». O’Reilly rewarded Mulroney by putting him on the international advisory board of the Herald’sparent company, Independent News & Media. On his visit to New Zealand, the Herald gave Mulroney (and NAFTA) a week of cringing star treatment, relegating the hugely popular anti-globalist author, Naomi Klein (who had attracted between 800 and 1,000 people to her public meeting in Auckland during the same week) to one interview in the lifestyle pages. Herald Assistant Editor and business journalist, Fran O’Sullivan, takes a leading role in business groups advocating a US-New Zealand free trade and investment agreement, and her writing in theHerald supports that stance. « Clear Channel owns over 1,200 radio stations and 37 television stations, with investments in 240 radio stations globally, and Clear Channel Entertainment owns and operates over 200 venues nationwide. They are in 248 of the top 250 radio markets, controlling 60% of all rock programming. They outright own the tours of musicians like Janet Jackson, Aerosmith, Pearl Jam, Madonna and N’Sync. They own the network which airs Rush Limbaugh, Dr. Laura, Casey Kasem, and the Fox Sports Radio Network. With 103,000,000 listeners in the US and 1,000,000,000 globally (1/6 of the world population), this powerful company has grown unchecked, using their monopoly to control the entire music industry ». Even the mainstream Internet news and commentary site, Salon.com has been running a series of articles entitled « Radio’s big bully: A complete guide to Salon’s reporting on Clear Channel, the most powerful – and some would say pernicious – force in the music industry ». « Clear Channel Worldwide Incorporated is the largest radio station owner in the country. It runs more than 1,200 channels, which together account for 9% of the market. Its CEO contributed hundreds of thousands of dollars to Bush’s election campaign. When hundreds of thousands of American citizens took to the streets to protest against the war on Iraq, Clear Channel organized pro-war patriotic « Rallies for America » across the country. It used its radio stations to advertise the events and then sent correspondents to cover them as though they were breaking news. The era of manufacturing consent has given way to the era of manufacturing news. Soon media newsrooms will drop the pretence, and start hiring theatre directors instead of journalists ». Meanwhile, Clear Channel is lobbying intensively and successfully to have restrictions removed that try to preserve some degree of competition in the news media. « The company’s top management has a history with George W Bush. The vice chairman of Clear Channel is Tom Hicks, whose name may be familiar to readers of this column. When Mr Bush was Governor of Texas, Mr. Hicks was chairman of the University of Texas Investment Management Company, called Utimco, and Clear Channel’s chairman, Lowry Mays, was on its board. Under Mr. Hicks, Utimco placed much of the university’s endowment under the management of companies with strong Republican Party or Bush family ties. In 1998 Mr. Hicks purchased the Texas Rangers* in a deal that made Mr. Bush a multimillionaire ». * An American football team, not the actual Texas Rangers police force. Ed. CanWest is headquartered in Canada, but it is also has interests in Australia, Chile and the UK. Not all of its Australian interest has voting rights, due to Australian restrictions on overseas ownership of news media. CanWest is lobbying to allow it up to 50% voting shares. Lobbying and politics are not unusual for Izzy Asper, owner of over 90% of the voting power and 65% of the equity in CanWest. He has been a leader of his province’s (conservative) Liberal Party, and was a vocal supporter of the economic policies of the last two decades in New Zealand, particularly the « zero restrictions on foreign investment in the media ». « I was recently representing Canada in Brussels at a Group of Seven (G7) meeting. I said to all the G7 heavyweights, Japan, the US and all, ‘The only example in the world of a country that has its head screwed on and isn’t distracted by silly stuff is the government of New Zealand.’ Since the reformation in New Zealand in the 80s, you’ve become the experimental laboratory for the entire world. Sir Roger (Douglas) has travelled to Canada and is revered … the fact is, New Zealand is one of the most professionally managed countries in the world ». Adding to the political flavour of the company, in August 2000 CanWest bought 13 big city newspapers, many other smaller dailies, Internet properties and various other interests in Canada from Hollinger Inc, in one of the biggest media transactions in Canadian history – valued at $NZ7.7 billion. Hollinger was chaired by the notorious extreme Rightwing media baron, Conrad Black, whom we have already met through his former interest in Fairfax. In the transaction Black gained a 15% equity interest and 6% voting interest in CanWest – the second-largest stake behind the Asper family – and two seats on the CanWest board, one of which he intended to take personally. However as it turned out, it was not Black that became the villain of the piece. Rather than imposing his Rightwing views, he pursued personal glorification, renouncing his Canadian citizenship to enable him to become Lord Black of Crossharbour in the UK, and selling his stake in CanWest. Instead, the controlling Asper family imposed a rule that « all 14 of its big city newspapers would run the same national editorial each week, issued from headquarters in Winnipeg … Any unsigned editorials written locally at the 14 papers, the company said, should not contradict the national editorials, which covered such subjects as military spending, the Israeli-Palestinian conflict and property rights ». « The decision provoked immediate complaints from journalists across Canada, who say its effect goes far beyond the editorials, imposing control on columnists and reporters as well … Many journalists say the company is breaking age-old traditions that keep reporters and columnists independent of the publications’ owners ». The Aspers showed no sympathy: « CanWest publications committee chairman David Asper borrowed lyrics from the rock group REM: ‘I can say to our critics and especially to the bleeding hearts of the journalist community that, « It’s the end of the world as they know it . . . and I feel fine »’ … John Miller, Director of the Newspaper Journalism Program at Ryerson University, Toronto, said that CanWest newsrooms have become demoralized… ‘If it goes against what is perceived as the Asper line, then some stories aren’t going to get written, or some stories will be written and then they will be killed.’… » Columnists were censored or discarded. A regular columnist was forced to resign after writing a column critical of the Aspers. The trend was confirmed in June 2002, when the Aspers dismissed Russell Mills, the publisher of the Ottawa Citizen in their Southam Newspaper chain. Mills said he « had paid the price for not letting CanWest review an editorial calling on the Liberals to overthrow [Canadian Prime Minister] Chretien if he did not resign and a longer, critical review of the Prime Minister’s record ». The Aspers are close friends of Chretien. Southam ordered all its major papers to run two special editorials attacking journalists in general, and the Ottawa Citizen in particular, for their reporting of the sleaze scandal surrounding Chretien. The Director of Carleton University’s School of Journalism, Christopher Dornan, commented that the Aspers had « compromised the integrity of their entire newspaper chain » by their action in sacking Mills. « This, unfortunately for the country, extends into the corridors of governance as well because this seems to be an action taken – perhaps independently – at the behest of the Prime Minister ». He said the Aspers « did not fully understand what it took to run a news organisation ». The action showed « they would act with impunity and not tolerate any employee deviating from the party line ». TV3 was in the centre of controversy after the 1999 election when it revealed that it donated $25,000 to the National and Labour Parties (as had INL as I have mentioned) and not to minor parties. « However, in the case of broadcasting, I am recommending against any significant liberalisation for three reasons. Firstly it is important that our media reflect our values and our culture. It is clear that New Zealanders put more value on a media that informs rather than just entertains. These and other cultural values will only be protected by New Zealand ownership. Secondly, we make world class broadcasting in this country. Thirdly, foreign broadcasting will have a pervasive role in our media. Already radio and television are dominated by overseas programmes, and direct satellite television broadcasts from overseas will be a reality in the near future ». (Guess who said this ). I have outlined the ownership of the media in New Zealand, and have shown that it is very concentrated, and concentrated in the hands of large overseas media organisations. The significance of that state depends on the importance of various factors in determining media content and emphasis. The factors that are frequently identified are concentration of ownership vs competition; the effect of commercialism; the nature of the owners; and whether the owners are overseas or local. There are many elegant and persuasive statements from people for whom one would have the greatest respect to the effect that a healthy society requires a healthy diversity of competing media expressing different views. In that view, competition is seen as a solution to the dominance of a few narrow viewpoints. Yet this is not the whole answer. Competition in ideas is indeed a healthy state. But competition of commercial news media organisations is likely to be largely at the commercial level. Commercialism arises from the profit motive, which then outweighs the needs of society for accurate and relevant information. It mainly functions through advertising. According to sharebroker, Forsyth Barr, « the business of newspaper publishing is selling advertising ». Doubtless they would say the same for all news media. Advertisers are the real customers of a commercial media organisation, not its readers, viewers or listeners. This brings pressure to shield advertisers from views they do not like, to avoid complicated or expensive stories, and to avoid content that does not attract the maximum possible audience at any given time. Commercial competition does not provide a variety of voices. Rather, it provides sameness of voices for fear of driving off mass audiences – and for ownership reasons I shall return to. We only have to look at our television over the last decade to see this starkly illustrated: one where commercials are often more creative than its programmes (and certainly have more local content). Thus if we focus on competition, it must be on the competition of ideas, and that will only be genuinely released when the commercial aspects of news media production are minimised or removed altogether. Hence we have the vital need for public-interest broadcasting, whether government or community owned. Perhaps we also need public-interest print media. There is a gap waiting to be filled – that is for a quality national daily newspaper. One further comment is important here. The mainstream media fulfil a critical function that all the Indymedia, Internet email lists, alternative media of all forms, and even most commercial magazines do not fill. That is that they set the agenda for discussion, for people’s common view of the state of the world and for what is important in it. Once that agenda is set, it is very difficult to rearrange, even with quite literally the best information in the world. Yet it is that agenda that frequently guides people’s actions and priorities. So the mainstream news media – which are frequently the commercial news media – remain vitally important despite the growth of wonderful new forms of information distribution. What is the significance then of ownership? It must determine the direction taken by the increasing similarity of views and sources presented in the media. « About one-quarter of the local and national journalists say they have purposely avoided newsworthy stories, while nearly as many acknowledge they have softened the tone of stories to benefit the interests of their news organizations. Fully four-in-ten (41%) admit they have engaged in either or both of these practices ». But disturbingly often, news suppression is to protect the news organisation itself: the owners. Of those surveyed, « More than one-third (35%) say news that would hurt the financial interests of a news organization often or sometimes goes unreported ». Investigative journalists are most likely to cite the impact of business pressures on editorial decisions. When we reflect back on the strongly held political views, the commercial practices (including high levels of tax avoidance) and willingness to bend, or lobby for removal of, restrictions on their freedom of action, of the owners of our media, we should not wonder why issues like media ownership, the unpopular economic policies of the 1980s and 90s, international trade agreements, and business behaviour are not more intensively scrutinised by our news media. Closer to home, the Australian Broadcasting Authority has commissioned research which provides further evidence on the effect of ownership interference and influence. Could it happen here? Given that the owners of most of New Zealand’s news media have world-wide interests, and the examples presented here, it would be amazing if it did not. « Does the extent of foreign ownership matter? Clearly it does. Foreign private owners have no particular concern for our national identity and culture. In television terms, why should they spend money on New Zealand programmes when they can import proven ratings winners for a fraction of the cost? To make a New Zealand documentary costs roughly ten times as much as an existing programme from the BBC, Australia, or some other foreign distributor. For a locally produced drama or mini-series, the differential is even greater ». Australia takes these matters seriously enough to maintain the Australian Broadcasting Authority to monitor and research these issues. Australia’s media ownership laws, though constantly being defended against the media owners themselves, have for many years restricted both overseas ownership of the news media and cross-ownership of the different media – television, radio and newspapers. The current Australian government is in the process of removing restrictions on foreign ownership of the print media, but initial indications are that it may retain some regulation of cross-ownership. However even this is likely to be under threat in the negotiation of the Australia-US Free Trade Agreement. Restrictions on cross-ownership of the media exist in many other Organisation for Economic Cooperation and Development (OECD) countries. Such regulations attempt to use competition and ownership restrictions to encourage diversity of views and local content and control. Given that they do not address the problems caused by commercialism, and the continuing dominance of a few owners in even strongly regulated countries like Australia, the effect is useful but limited in effectiveness. Creating and strengthening publicly owned news sources and broadcasting are further options that many take. Even then, commercialisation through reliance on advertising can simply replicate the problems presented by privately owned media (as our own public TV channels have graphically shown). Because of our commitments under the General Agreement on Trade in Services (GATS) in the World Trade Organisation (WTO), we would be restricted in the restrictions we could put on cross-ownership and foreign ownership of our broadcast media; yet we should be trying to do just this. The evidence I have presented shows that in New Zealand, changes in the ownership, regulation and commercialisation of our media are long overdue. Endnotes: The quote is from Richard Prebble, Minister of State-Owned Enterprises, on changes to New Zealand’s broadcasting rules, 1988. Detailed endnotes for this article are available from CAFCA on request.